Introducing the all new 900MHz portable digital radio from Motorola! The new DTR700 is backwords compatible and is packed with new features. Introducing the all new Motorola DTR600 and DTR700, available for purchase beginning December 1, 2018! These new radios will replace the DTR550 and DTR650, and offer a more compact, reliable, and modern take on your reliable radio. Not only does this new model have a color screen, but it's LICENSE FREE and does not require an FCC License to operate. 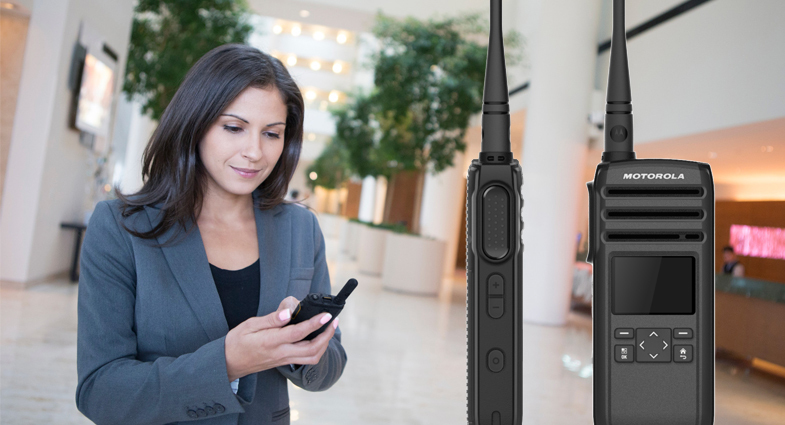 The DTR technology allows your voice communications to be louder and clearer across an extended range in order to best fit the needs of your staff operations. Revitalize: A new ID that is more compact in size and in color. Reliable: meets IP54 and Military Standards 810 C, D, E, F and G.
Remove: Housing contains built-in antimicrobial properties that prevent growth of mold and germs. Reach-out: Using Programmable Button and Call All/Page All function to talk to all radios without searching through the channel list. Re-Energize: During low battery, user can turn off the display backlight and vibrate with 1 enable key to conserve battery life. The DTR700 and DTR600 radios are identical in form factor but sold through different Motorola distribution channels.